Chipper Jones of the Atlanta Braves waves to the fans during a standing ovation as he steps to the plate at Turner Field. 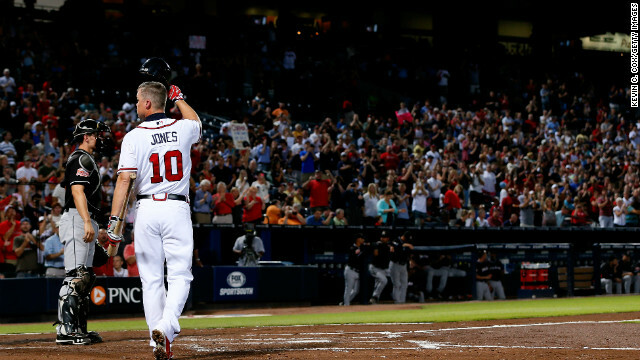 (CNN) – Very few pro athletes are afforded the type of farewell sendoff that Atlanta Braves' veteran third baseman Chipper Jones has been getting this season, his 19th in the major leagues. Not only has he been feeling the love from his hometown fans, but also those in opposing cities. [:26] "The gifts and the ovations have just been at times really overwhelming. Certainly unexpected." It's respect for a player who has Hall of Fame-worthy credentials. He's played the game the right way and honored its history. That combination means more than anything to baseball fans – whether its your own team's player or not. Jones is an 8-time All-Star, an MVP award winner, and was an integral part of the Braves' record run of success that included 14 straight division titles and a 1995 World Series championship. His statistics put him squarely in the conversation of the greatest switch hitters ever to play the game, alongside the name of Mickey Mantle, his idol. He's been the face of the Braves franchise on the field, and will retire having played his entire career for only one team – a rarity in the game today. [5:22] "It's easy to sit here and say I want to be a winner...I want to be remembered as a winner...I want to be remembered as a mentor and a good teammate. Yes, I want all of those things. But ultimately, when people get done, I want them to look whoever they're talking to straight in the face and say 'that boy was a ballplayer'." Jones final season will end with a little extra action. The Braves have clinched a playoff berth, so he'll get one more taste of the postseason, beginning October 5th. While he's retired he can work on getting his teeth white again unlike the brown tar film he likes to rock. Growing up in the Los Angeles area, I'v always been a staunch Dodger's fan. If there was a team I rooted for besides the Dodger's, it would have to be the Atlanta Braves, mainly because of Chipper Jones(Who happend to be a Dodger's fan growing up as well). All I can say is a Brave's game will never be the same without Larry, thank God for the tomahawk chop. I have the utmost respect for Chipper, but I'd be more surprised to see him get in the Hall in his first year than I would be if he never got in at all. His batting average and fielding are Hall worthy, and his on base percentage is out of this world (that may be what puts him over the top), but his total career stats fall short of most of the rest of the Hall of Famers mainly because he rarely played 150 games in a season. I think he belongs in, but just barely, and there will be a lot of resistance when his career gets looked at five years out. Derek Jeter has almost 600 hits on him with 2 fewer years in the majors. That comparison will be made. Chipper as a baseball on the field great. Off the field not so much. Why is everyone showering him with praise? He has acknowledged publicly that he fathered an illegitimate child born March 1998. "I've messed up royally," Jones said Wednesday during an interview with Morris News Service at his Atlanta home. "I've messed up just about as bad as a man can mess up without killing somebody. I've committed adultery and I'll pay for that the rest of my life." "I want to take this opportunity to publicly apologize to my wife, to the fans and to the Braves organization for not representing myself very well and not doing the things all those people expect me to do. I ask for forgiveness." Wow man, way to throw stones at a guy who made a mistake 15 years ago. I'm sure you have never made a mistake and live a perfect life. He is getting all this praise because he is an amazing baseball player. As a Braves fan since 1966...I will always remember the thrill of our worst to first 1991 season...the whole city of Atlanta came alive with the Braves...then Chipper signed on in 1994(the year of no world series).Chipper was instrumental in helping the Braves win their one and only World Series title in 1995.We Atlanta fans have always admired Chipper's contribution to the team...but as a fan of baseball...I can't tell you how good it feels to see fans from other cities all over this country...give the standing ovations...the cheers...the gifts...and the thanks and respect to one of the greatest players that has ever played. Back in 1988, when Chipper was a sophomore at the Bolles School here in Jacksonville, I had the opportunity to meet this tall, lanky kid who played shortstop and had skills that I had never seen in a HS student before him. Throwing batting practice to him over his remaining three years of his HS career was something that I'll never forget, as he was a "man playing against a bunch of boys" when games were played. Now, as he approaches 40, a few years younger than I was when first meeting him, his professional career has been the completion of what we first witnessed 23 years ago. He had been blessed to play the game of baseball like no other. He is a credit to his parents, Larry and Lynn. He is a credit to the integrity of the game I've loved for over 60 years. Before anyone throws stones as to his personal life, remember that we all make mistakes, and the true character of an individual is how we address those less than admirable moments. How we address personal failure truely is the measure of the person and becomes our defining moment. My daughter is 23 and that's how long I have been a Braves fan. While I was stationed at Ft. Benning I started to attend Atlanta games to watch my beloved Cubs, but that was the decade of the Braves and Chipper had a major part during that time with all the division wins and the World Series. Chip, thank you for taking the time to sign my ball and have a conversation. You were about 25 at the time and the Braves were in Houston. I'm glad you took the time to make Andrew Jones sign my ball as well. I know have a ball with the youngest player ever to sign on to a MLB team (17 Chipper) and the youngest guy ever to hit a homerun in the World Series (19 Andrew). Thanks for the great seasons and wish you and your family the best. Far from the youngest: there was once a 14 year old starting pitcher in the Major Leagues and teams sign 16 year olds from Caribbean countries almost every year. I had to look at this article and shake my head. My only memory will be of people (kids included) walking up asking for an autograph after a game and his response being "get the f! @# out of the way". He then turned to his teammates and had a nice laugh with them then. Everyone just turned away from him and said how they wouldn't ever want it. Sorry no class act here! Guess he just saves them for the camera and sports writers. I would wager to say this is complete bullcrap. Never heard of him doing anything like that. Yeah, this doesn't jibe with what I've seen over the past 19 years. He regularly signs autographs after batting practice. Do you think Bobby Cox would have let Chipper, or any ballplayer on one of his teams, get away with what the above poster claims? If so, you don't know much about how the Braves run their organization. He has signe plenty for me. Sounds like your are full of it. You must be a Phillies fan or something. Go hate on someone else. This is a great ballplayer who has stayed with this team his entire career and has been as amazing to the fans as we have been back towards him. He has always been a class act on the field and with fans. Chipper wouldn't turn a fan away, especially with that kind of attitude that you are claiming. Go rain on someone else's parade. Maybe class act as a baseball player, not so much as a husband and father. This article isn't about his personal life numbnuts. Love how the jock sniffers toss around that term...class act. They have no idea who he is. Class act. Winner. Was a joy to watch you play the past 19 years, Chipper. I've watched Chipper since he entered the league, and always as a member of "the other team". He has played the game the way it is supposed to be played, with class as well as talent. A true gentleman. I was able to see him one last time on a recent trip to San Diego, which luckily coincided with his last trip to Petco Park. The fan recognition and admiration was amazing. Thank you, Chipper. Played the game very well, a credit to MLB on and off the field, truly "that boy was a ball player"! What a great example for all of us (and I'm 61 years old). For us who would like our country to return to the core values that made our country great. Hehehe. See hooters note below. A great example for us all. Groan. Sounds like you are trying to say something but are just to stupid to know how The words you are looking for are " Damn I wish that was me"
As a long suffering Met fan, many times suffering at his hands, I say thanks Chipper for embodying what every baseball player should want to be. Thanks Chipper for the memories, you are a class act. I agree. I'm a Phillies fan and I really have a lot of respect for Chipper Jones. I watched his last game against the Phils and it was great seeing him get props from all the players. A class act all the way. Cheating on his wife was certainly not classy, going on the radio admitting he screwed up (literally) afterwards and answering any questions from listeners about it was a show of humility and class I will remember however. OK, good point. They don't discuss those kinds of stats on air so I didn't know about that. I was commenting on his long career and his ability to play the game the way its supposed to be played. However, if you want to get going on all of the athletes and others –in and out of the limelight–who make those kinds of "mistakes" we could be here all day. Chipper Jones has had a legendary career and I am so glad to see the outpouring of respect for him!